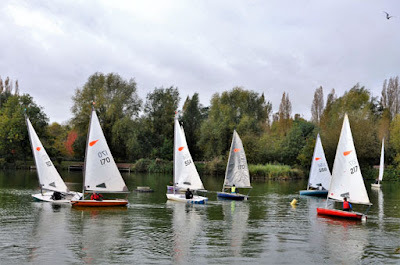 With the full force of Storm Brian due to hit Stanborough Lakes at 13.00, OOD Paul Lohr offered two three quarter hour races with a short break between. He set a there and back again course with each end a gate. A gallant band of eight set out into the lively conditions. Half way up the first leg I spotted a tree that needed pruning and spent a while relaxing in the shelter until a favourable wind shift allowed be to shoot back into the race. I spent the rest of the race lurching along mainly in the shelter of the trees on the western bank whilst unsuccessfully removing water and willow. Meanwhile in the proper race, it was mainly the women that were showing the way. Annette (Comet) skipped along ‘nay bother’ to win both the slow and combined fleet races; easily. Newcomer Katharine Woods (RS Q’ba) also showed us the way to handle the alternating light wind and severe gusts with a third overall 3rd in the first race. In the second, she was denied another ‘podium’ because her boat’s mast was ripped out. Sheila Stowe opted to help Roger Morse in the Leader. With wise heads in the boat they picked their way round the course with less drama than most, rarely coming out into the full force of the wind, to secure an overall third and second. Nigel (Supernova) spent long periods of time battling it out with Annette doing some spectacular planing but with rather more visits to the water. 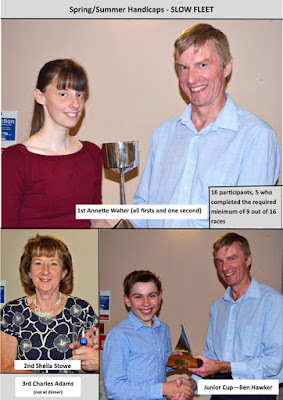 He did the minimum distance to win the first race…. 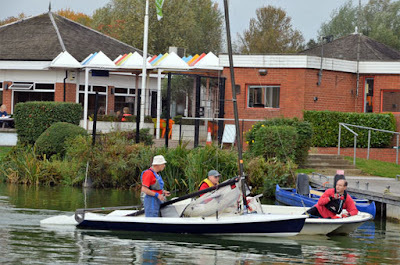 barely crossing the finishing line before abandoning his boat. Paul Sperring and James (Feva) bravely took on the very gusty wind but eventually decided spectating might be more enjoyable and joined Phil Walter (Comet) and Dave Campbell (Supernova) who survived the first race impressively, but opted out of race two along with me who thought it more important to become the official photographer in the absence of Val. 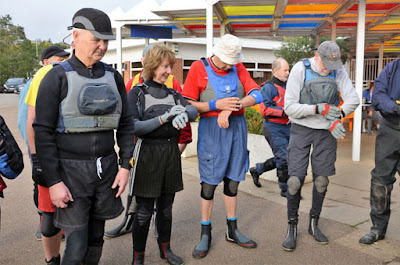 Perhaps sense prevailed whilst enjoying the break with generous helpings of Thelma’s birthday cake – she was desperately hoping that the races were not cancelled as it would have been impossible for Brian to eat all she had baked before they go off to the Isle of Wight to celebrate. Beautiful cakes; great cakes…. And last but not least the rescue team of Dave Lambert and Patrick Rohart did a grand job. 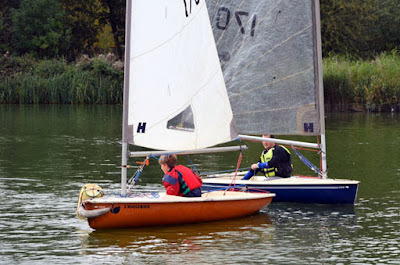 Such a shame they were on duty as they are two who relish sailing in such challenging conditions. 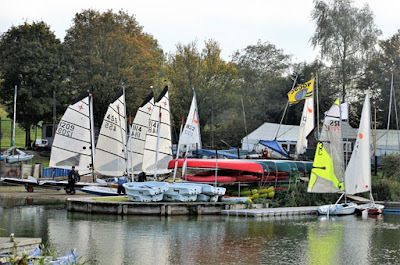 They were called upon many times over the morning and were given interesting problems getting boats back to safety especially the Feva with a fallen mast from the top of the lake. 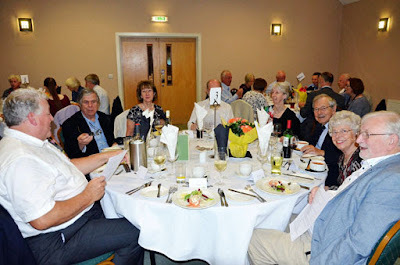 52 members and friends had a very enjoyable Annual Dinner at the Mill Green Golf Club, following the Commodore’s Cup Race earlier in the day. 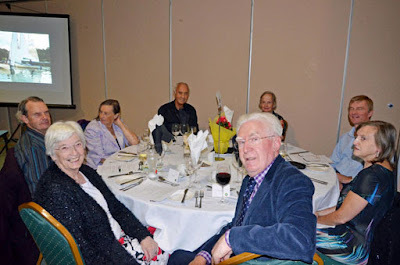 Our wonderful organiser, Sheila Stowe, made sure every single detail was perfect and a really good time was had by all. 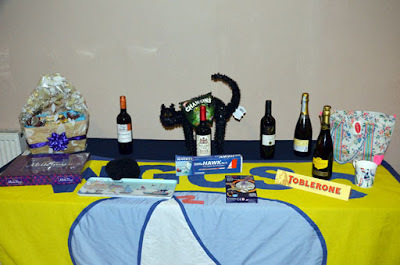 As usual there was a raffle and thanks go to junior Lucy Hawker and Graham Hunt’s daughter, Louise, for doing a great job selling tickets and distributing the prizes – first to go was a scary Halloween Cat decoration, but the bottles of wine were as popular as ever! 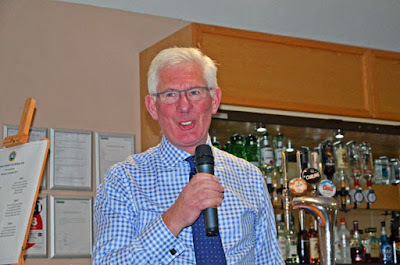 The major highlight of the evening came when Phil Walters (deputising for Race Officer Charles Adams) announced the winners of the 2017 Spring/Summer Handicaps and Spring/Summer Pursuit races. 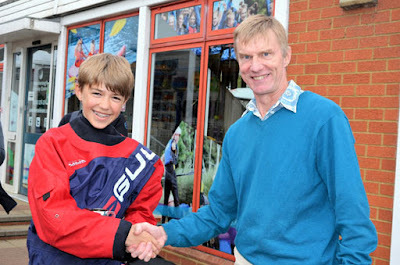 An extra special round of applause went to Ben Hawker when he was named as the winner of the Junior Handicaps Cup. 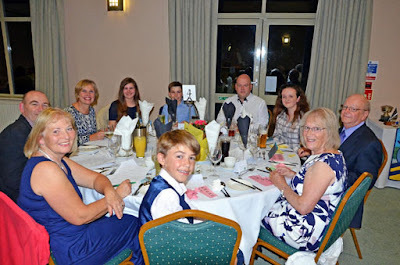 Everyone was agreed it’s great to have some keen juniors in the club again. A non-stop show of the year’s sailing pics by Val Newton, projected by tech maestro Shaun Smale completed the evening. 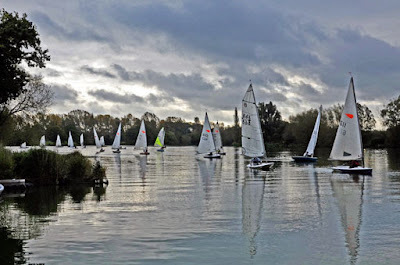 There was an excellent turnout of 17 boats for the Commodore’s Cup, which took place on an unpromising, grey, light wind day at Stanborough. It included two “mini fleets” of seven Comets and five Supernovas. Commodore Nigel Davis announced the format would be different this year. There would be a Pursuit and a Handicap back-to-back before coffee, then a second Handicap after the break. The event would be decided as the best two of three races (ie one discard). The idea was to provide keen competition not only at the front of the race but also down the fleet. 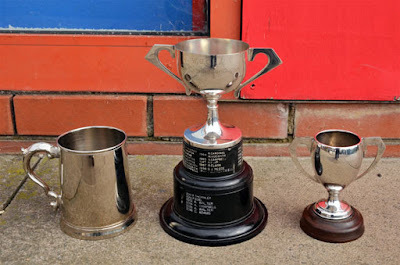 He also said there would be three trophies on offer – the Commodore’s Cup, the Backbone Trophy for the highest place helm who has not won a series or special race in the last five years, and a Commodore’s Junior Cup for the first junior (under 19). 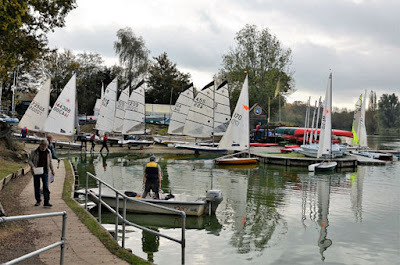 This last piece of news caused a delighted stir amongst the four possible qualifiers at the briefing – Tom Etherton, Ben Hawker, Lucy Hawker and Samuel McAlister. Nigel wasted no time in getting the Pursuit under way, with the help of his assistant, Ian Stringer, who toiled over the laptop computer in the hut during the racing to make sure all the results were spot on. Sheila Stowe beat all the other Comets to a great start in the Pursuit. Dave Campbell was the first of the Supernovas across the line. After that, the running order was ever changing. 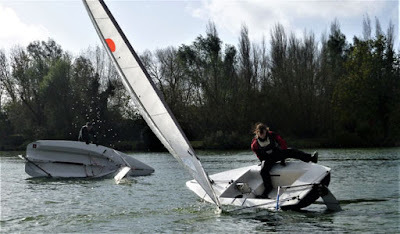 Two sailors suffered gear failures during the first race – Peter Thornley’s sail suddenly dropped down the mast because he hadn’t fastened it properly, and Paul McAlister’s sail parted company with the end of the boom but he managed to re-tie it on the water. 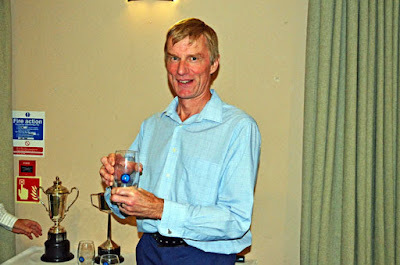 When the final reckoning came, two sailors were in equal contention for the Commodore’s Cup – Peter Thornley and Dave Lambert. Commodore Nigel Davis said the rule was the last race dictated which one had won, and this turned out to be Dave Lambert. 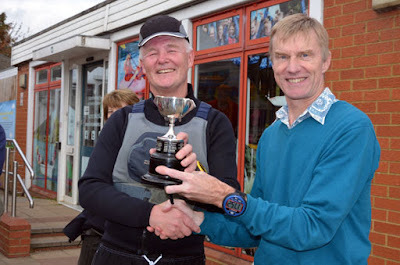 Dave was thrilled “I’ve never won the Commodore’s Cup before!” he exclaimed. 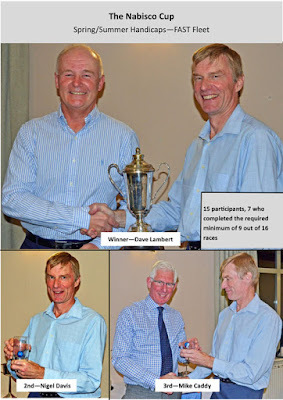 Dave Lambert wins the Commodore's Cup The Backbone Trophy was won by Mike Caddy. 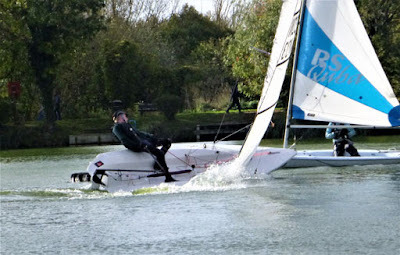 Commodore’s Junior Cup was won by Tom Etherton. 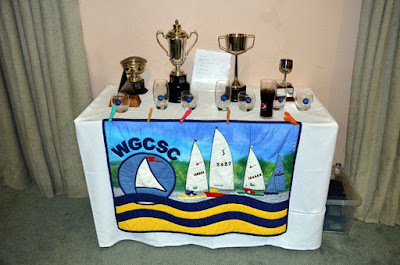 The full Commodores Cup Results can be seen here. 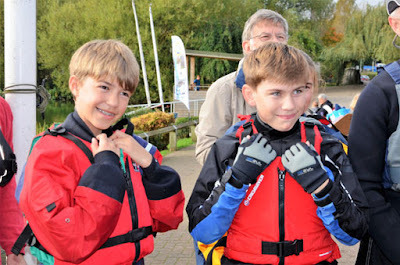 Thanks go to Alan Pearce for driving the rescue boat, and his assistant Simon Hawker. They performed one particularly important task all morning – bringing Peter Thornley back to the lagoon after his sail came down! 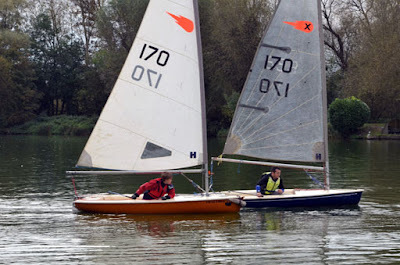 The good natured rivalry between juniors Ben Hawker and Tom Etherton – who are both students at Verulam School – continued onshore during the Commodore’s Cup. At the coffee break, they were exactly equal with a 1-2, and a 2-1. 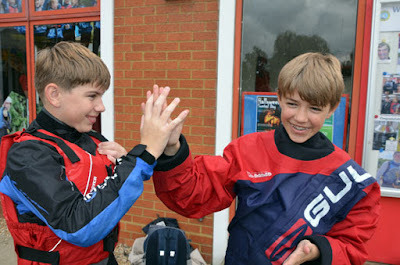 They shook hands and wished each other “Good Luck” with the deciding third race … which eventually went to Tom. 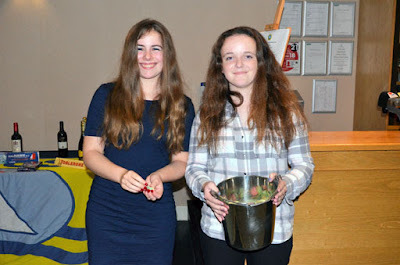 After the Junior Cup was presented they high-fived each other in celebration – it’s good to see such sportsmanship in the club. 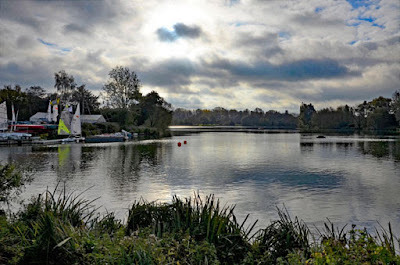 A selection of Val's photographs can be seen below and the whole Google Photo Album here. (New window). 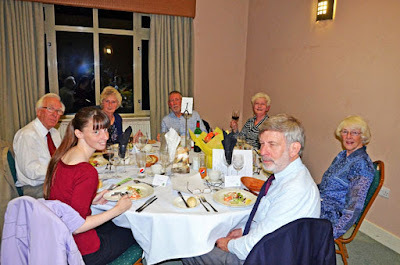 Testing Loading Google Photos to website. Dave and Patrick make it two in a row! Congratulations to Dave Lambert and Patrick Rohart, who beat off competition from nine other teams to win the much coveted Punch Bowl Trophy for the second year running. 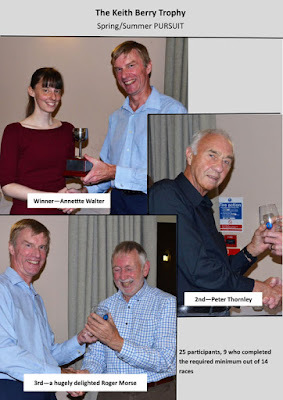 They not only put Comet sailors Phil & Annette Walter into second place, they also managed to withstand very strong challenges from fellow Supernova sailors, Shaun Smale & Tom Hebbert, and Dave & Alan Campbell. To say they were absolutely jubilant when OOD Ian Stringer announced the result is an understatement! The Walters - How it should be done. Messrs Rohart & Lambert - How it shouldn't be done. 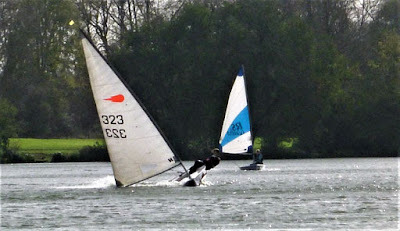 Sailing conditions were ideal for this three-hour pursuit, with a consistent gentle breeze throughout the morning. Supporters turned out in force, and everyone enjoyed a cup of hot punch when racing was over – thanks to Marjorie Adams for doing the honours. 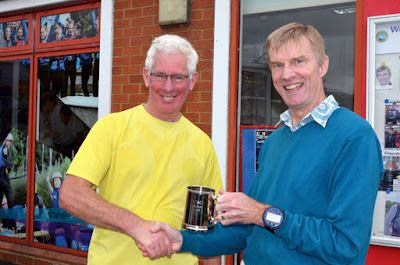 Dave Lambert & Patrick Rohart are presented with their trophy by Ian Stringer. Samuel McAlister, Tom Etherton, and Ben & Lucy Hawker pose with the Trophy....They wish! 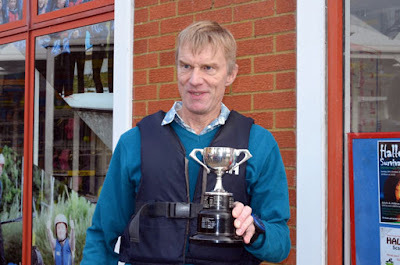 Big thanks also to Ian & Jill Stringer for all their hard work running the race, and to Alan Pearce and Simon Hawker for manning the Safety Boat. 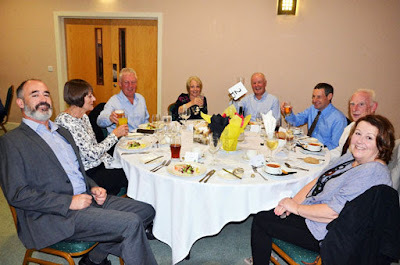 Appreciation also goes to Karen McAlister who helped Val with some of the picture taking. Have we found Messrs Lambert and Rohart's secret to success? - Their Support Team! To see all of the photographs taken by Val Newton and Karen McAlister in a new window, click here. 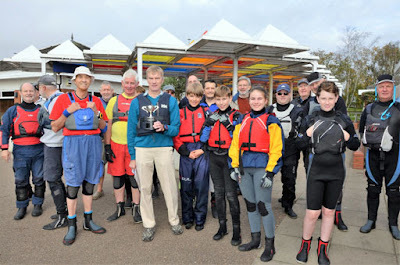 The Winter Pursuit series kicked off on 23rd September. 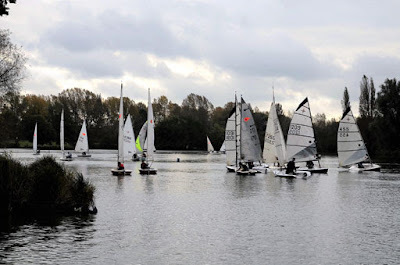 On the face of it, it was a regular Saturday and 12 boats competed. 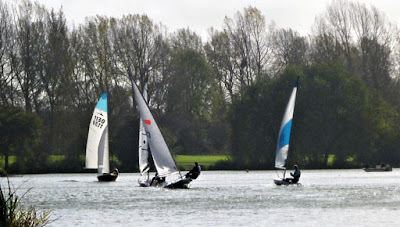 But, a little “miracle” took place … Charles Adams helming his trusty Miracle 1625, had a great morning and won BOTH races. He beat Graham Hunt into 2nd place in the first race, and Nigel Davis into 2nd in the second race. 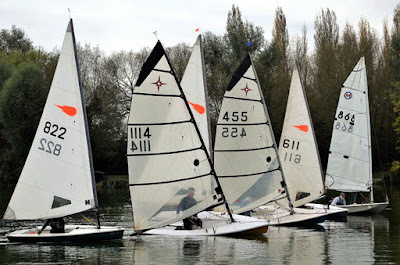 All sorts of other good things went on too … it was pleasing to see junior Tom Etherton growing in confidence, sailing his Comet 170 into 10th place in both races. 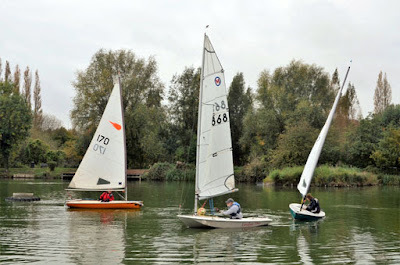 His fellow junior, Ben Hawker, had a 12th and 11th but, more importantly, he too was competing to the best of his ability against all the more experienced sailors. Both have lots of exciting potential. 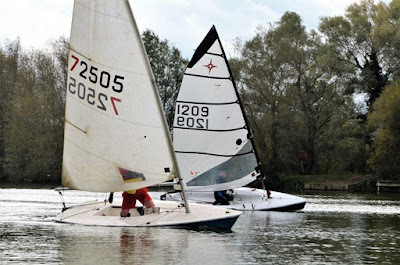 A “summer evening sailing graduate”, Paul Sperring, plus his small son James, also put in a first appearance in a hired RS Feva and came 11th and 12th. 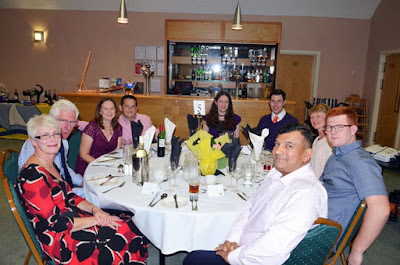 The OOD was Paul McAlister, ably assisted by Will Etherton (Tom’s Dad). Both are relatively new Wellys, but they handled the multiple starts and finishes as if to the manner born. The two of them have quickly become great assets to the club. 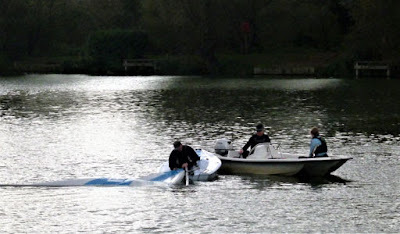 Out in the safety boat, Simon Hawker, (Ben’s Dad), was assisting Rescue Driver, Shaun Smale. He’s done this duty many times already, which is much appreciated. On shore, recent sailing recruit Tom Hebbert arrived with his wife Alannah, 3-year old Eliza, and baby Ava. 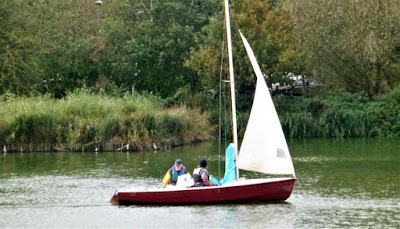 He took Eliza out for a little sail round during the first race but regrettably no one had a camera handy so there is no pic of this maiden voyage. However, it all augers well for the future. It may have been “an ordinary Saturday” but all sorts of interesting things were still going on! Can you see the smile on Charles' face?